Here’s the report from the Feb. 25, 2015, Uptown TIRZ 16 board meeting about when the once-a-boat launch on Buffalo Bayou in Memorial Park at Woodway might be reopened. Please note that Texas constitution guarantees the right of the people to access navigable waterways through public land. The fenced-off Parks and Wildlife Paddling Trail takeout, referred to by the TIRZ as the “Woodway outfall,” is in need of a guardrail above a steep drop-off, parking reserved for the handicapped, and a gate that allows the park area to be closed at night, according to Sarah Newbery, the TIRZ 16 project director for Memorial Park. The bayou access point on public land west of Loop 610 has been surrounded by a locked, curtained fence and closed to the public without explanation for almost a year since construction and landscaping were completed on the $1.36 million “erosion control” and drainage improvement project. The larger park area, known as the Old Archery Range, has been closed without explanation for nearly a decade. The Houston Parks and Recreation Department is reviewing plans for the guardrail, parking, and permanent access gate for the former boat launch, Newbery told the board members meeting on the seventeenth floor of 1980 Post Oak in the Galleria. The TIRZ expects to send the plans out to bids in April and to finish construction by August, Newbery reported. There will be a sign on the site by next week explaining all this to the public, said Newbery. But why should the public not have access to the bayou through the park now, since there appears to be no legal or even safety reason why this part of the park should not be open in the meantime? The parks department could erect a temporary guardrail above any drop-off it deems dangerous, as it has done in Buffalo Bayou Park. There’s already a gate and a parking lot. Uptown TIRZ Board to Meet: Is the Closed Woodway Not-A-Boat Launch on the Agenda? Is anybody really planning to build handrails or a parking lot to make our $1.36 million once-upon-a-time boat launch in Memorial Park “safe” for the public to use again? We’ll find out Wednesday, Feb. 25, at the regular meeting of the board of the Uptown Development Authority/ TIRZ 16, which is supposed to be funding further improvements (with our tax money) to the site reconstructed last year on Buffalo Bayou at Woodway. Project planners somehow forgot to include those user-friendly details when they designed the new drainage outfall “erosion control” project, according to the TIRZ and city parks department. However, the new not-a-boat launch, with its long sloping ramp, looks perfectly usable to a lot of people, despite usually being covered in mud. But the city parks department says no, it’s not safe and the parking isn’t exactly right, so the area remains closed even after construction was completed about a year ago. The board meeting of the Uptown TIRZ/Development Authority takes place Wednesday at 3:30 p.m. in Suite 1700, 1980 Post Oak Boulevard. 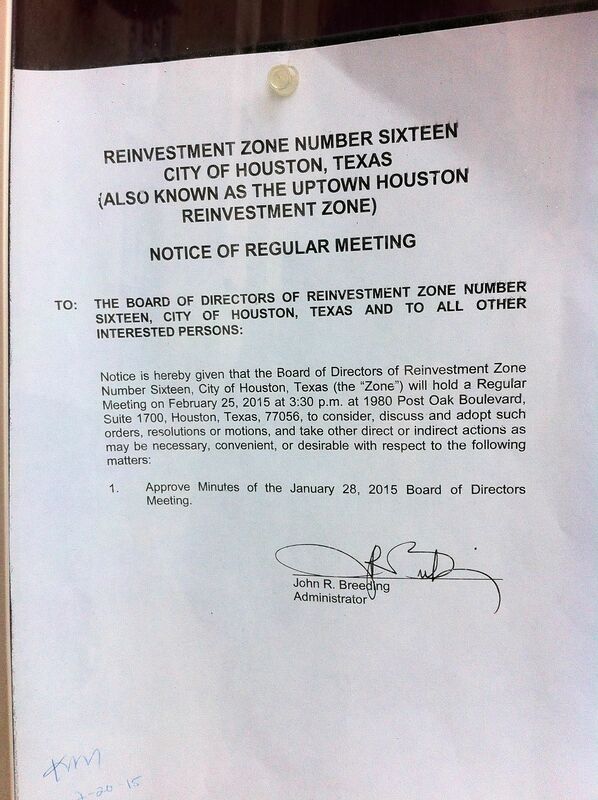 Notice of TIRZ 16/Uptown Development Authority board meeting posted on City Hall bulletin board. An official Texas Parks and Wildlife Paddling Trail takeout, the formerly wooded ravine in what’s known as the Old Archery Range west of Loop 610 has been closed to the public for almost two years while trees were cleared, slopes dug out, and a massive outfall installed. The landscaped, irrigated project, described by the TIRZ as a drainage and “erosion control” project, was completed almost a year ago but the curtained, heavy-duty fence and gate remain locked. SWA Group did the landscaping and AECOM the engineering design. The once-a-boat-launch is the closest official public access for paddlers to float down Buffalo Bayou through the historic nature area that the City of Houston and the Harris County Flood Control District plan to destroy. Known as the Memorial Park Demonstration Project, the $6 million proposal to bulldoze the riparian forest, dredge and channelize this relatively untouched stretch of bayou has the support of the Bayou Preservation Association, the Memorial Park Conservancy, and the Buffalo Bayou Partnership. 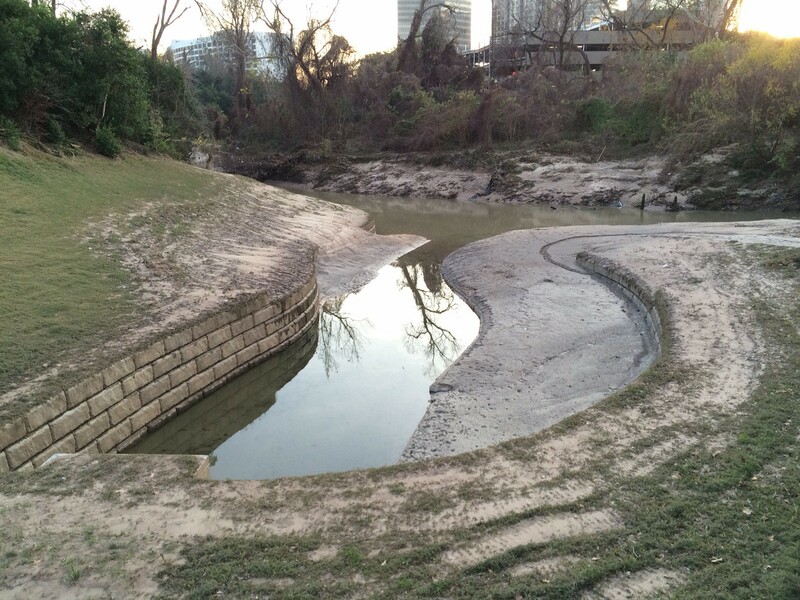 Rumors have been flying across the concrete prairie and through the riparian woods of Buffalo Bayou that what was once a popular boat launch in Memorial Park at Woodway will be opened again to the public maybe by March or April. And while we have determined that there is not actually a definite plan yet for opening the once-a-boat-launch, we can confirm that there may be some plans eventually to possibly appropriate some money to build handrails for safety and handicapped access, a proper parking lot, and some other stuff that city officials claim are required to make the longtime, popular no-longer-a boat-launch safe again for the public. 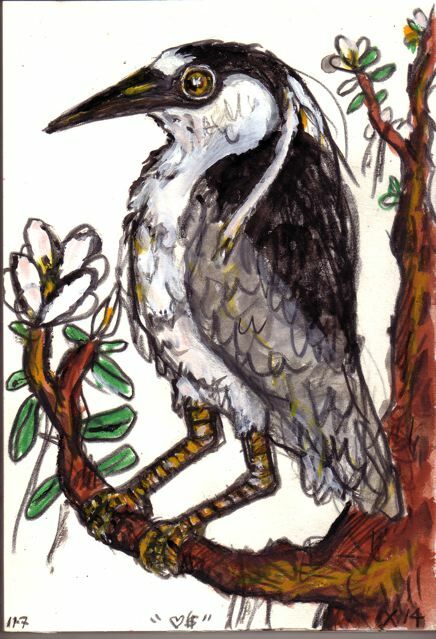 The Uptown Tax Increment Reinvestment Zone (TIRZ) 16, which in 2013 expanded to include Memorial Park, will consider funding the improvements “required to open the area as a public access point to the bayou,” Sarah Newbery, Memorial Park project director for the TIRZ 16, said in an email. This budget decision will happen at the next board of directors meeting on February 25, 2015, at 3:30 p.m. in Suite 1700, 1980 Post Oak Boulevard, said Newbery. Why an unelected semi-private entity controls our public park, we don’t know. But the Uptown TIRZ meeting notices and agenda are posted 72 hours prior to the meeting at the Houston City Hall Public Bulletin Board, at the rear entrance of the City Hall Annex, 900 Bagby. So go downtown and park and find the bulletin board and look on it to see what’s on the agenda. There does not seem to be an online notice. Read the rest of this update. The drainage outfall but not a boat launch covered with mud in Memorial Park at Woodway. Photo by Bill Heins on January 16, 2015. We lost track of the number of times our jaws dropped listening to Steve Hupp present the Bayou Preservation Association’s argument for destroying one of the last natural stretches of Buffalo Bayou in Houston. Briar Forest, which is south of Buffalo Bayou between Gessner, Westheimer, and Dairy Ashford, has been fighting its own battle with Flood Control over a plan to destroy a significant amount of forest to create stormwater detention basins. City Council Member Oliver Pennington was at the meeting. Pennington, who is running for mayor, represents District G, which includes Briar Forest way out there and much closer into town, the south bank of Buffalo Bayou in the “bank restoration” project area. The south bank, which is half of the project, is owned entirely by the River Oaks Country Club, founded in 1924, of which Pennington is a member and which is donating $2 million or one-third of the projected cost of the “stabilization” project. The club is in the process of digging up and rebuilding its golf course, which over the decades has encroached on what was once thick riparian forest, moving closer and closer to the edges of the high banks of the bayou. 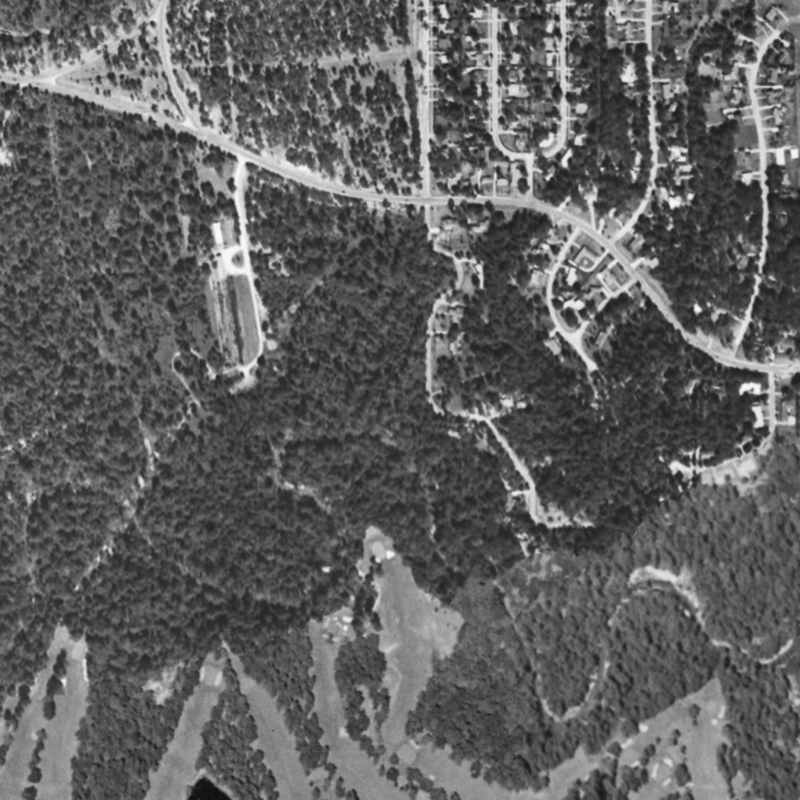 An aerial photo taken in 1953 of Buffalo Bayou and surrounding riparian forest in the project area.